No worries, Clark. You're a good man for cowboyin' up. That's why God gave us those things, you know, so we could step on them occasionally, myself included, of course. I like the idea of the single Weber in the center but many will poo poo the idea. What have you done to the inside of the engine ? Thanks. I like the idea of using the T4 2L engine. A few mods and 120-140 dependable HP. 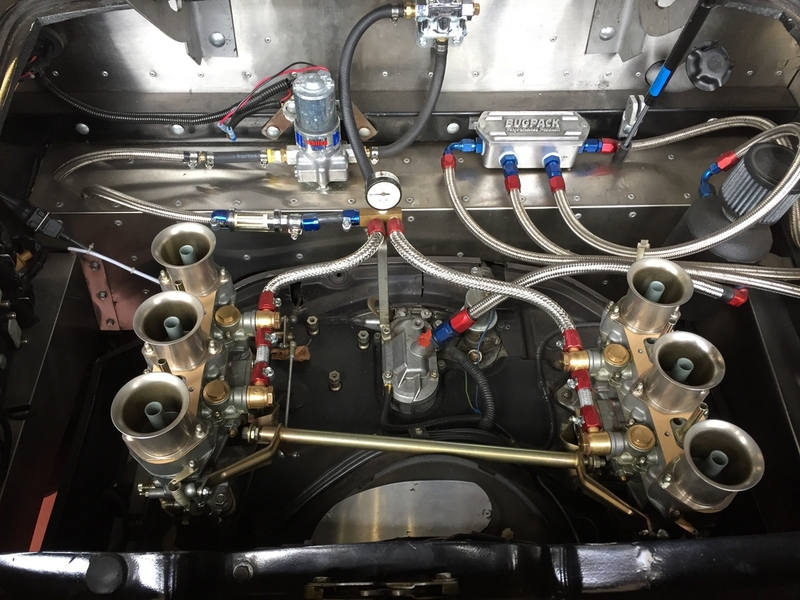 There is so much room in the 359 that a T4 with the flat pancake cooling tin would easily fit and actually be easier to service. Mt Type IV is stronger and smoother than the day I picked it up at Jake Raby's 35,000 miles ago. For me the ultimate test is the 13 trips home from Carlisle using I-40 and that 8 mile super steep section of I-40 East of Asheville where with my original 1915 Type I had to use second gear and sometimes even third to ascend that stretch. Big trucks can go only 30-35 mph there. Now on that road I do 75 in 4th gear with ease and a big reserve in power. Never had to stop mid-trip for anything but gas, and never a backfire or failure of any sort to date. Interesting side note---that stretch of I-40 going East (down the mountain), it is so steep that at every 1/2 mile or so there is a runaway truck emergency exit with a deep sand surface and these exits are positioned so that they turn up a hill for trucks with brake failure to use to stop quickly. That part of I-40 is steeper than anything I have ever seen in the country anywhere. For some reason the highway engineers went straight up the mountain side rather than going around it like they do even in the Rockies. Did I say it was steep?? Anyone know that stretch I'm talking about? Imagine how this type IV pulls on a flat road. I love the idea of Suby power but I'm very satisfied with this engine. I don't have ac but there is an Espar heater making it a true year-round driver here in Dogpatch. Wolfgang---best of success with whatever way you choose to go for power. 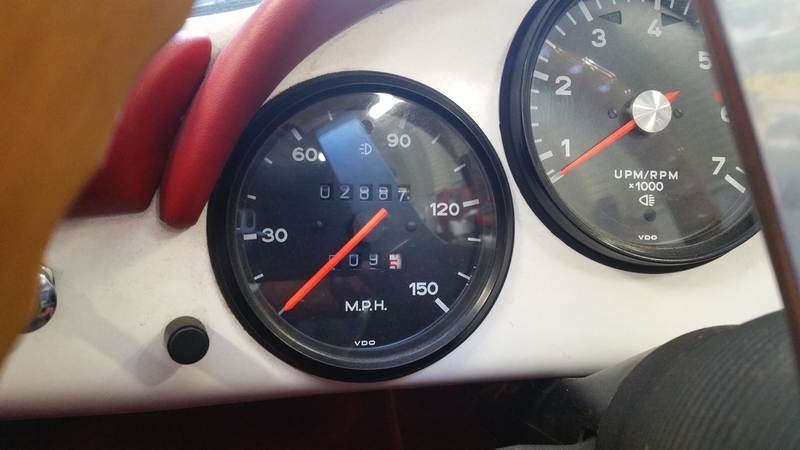 Yes Sir, that’s what I am running now a Porsche 914 two litre T4 with 96mm x 76mm bore and stroke makes 2.2 litres with stock cooling It has lots of room for the stock fan and room enough for a nice dual exhaust that is far away from the fan which is something I always hated in my Porsche 912 with T4. Their it was so close that the fan sucked in the hot air around the muffler! I have driven that stretch of the mountains it is a cool stretch for sure and it is a work out for most 4 cylinder cars for sure. You need the Type IV torque numbers to keep going without shifting into a lower, then lower, then lower gear. Well can't wait to drive that mountain stretch of highway and go to Carlisle! I know that stretch of road. Not very PC but I have a sheet showing slaveholders in Tuscaloosa County showing the 15-20 ancestors who owned 75-80 "workers". Two of the plantation homes are still there and recently one changed hands and is still occupied. Having an interesting time with family genealogy. One of the most startling finds is a pay stub to that Revolutionary War ancestor (Captain John Foster) showing his pay that month when his unit was at Valley forge with G. Washington. I got that in a genealogy research place in New Orleans a few years ago. I got my sister into DAR with this research and myself and son, Russ in the Sons of the American Revolution (SAR). 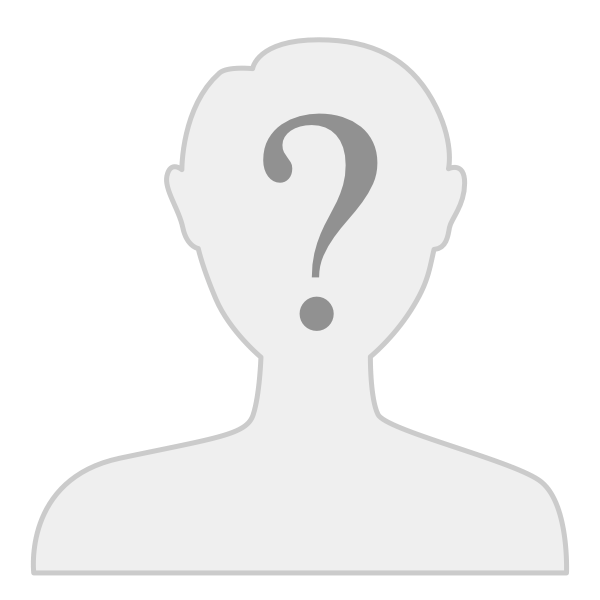 Iam -Ray---why did you bring Tuscaloosa up? Ok,, just have to clear up some of the misconceptions about the 359. I have collected a lot of information on them, over the past 4 years,, and even discussed them with a former CMC employee, so I am reasonably sure of my statements. 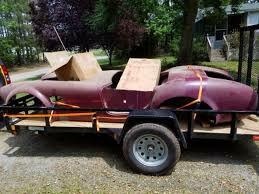 The 359 was layed up in its own molds,, and is not a 356 with extra pieces grafted on. Mine certainly is made with single layups. The body shape is very different from a 356's,, and the wheel base is 89.5 inches. Mine weighs in at 1760lbs (with a 1/4 tank of gas). I do note however, that the literature I have says it can weigh up to 1875lbs, depending on engine choice. The only panels that it shares with the 356 are the doors and windshield assembly. My car has had 3 years of pretty spirited driving,, and it is not showing any serious cracks. Previous owners drove it for 3 more years prior,, but I think they were relatively gentle with it. I have certainly seen lots of cmc 356's with a lot more cracking. So I guess I am lucky. The kits came with a filler panel where the oem Porsche center reflector could be mounted. Some owners will throw the 911sc reflector cause it looks so much better. But you have to look long and hard to find one at a reasonable price (yes,, I did). I believe Porsche could care less about 356 replicas or any of the other older designs that might bear its likeness. They are not like Ferrari or Lambo' in this respect, and are not likely to sue anyone. 359 kits were produced by CMC mostly,, and a few by ThunderRanch. I don't think any kits were manufactured overseas,, but kits shipped everywhere,, and could certainly have found their way back. 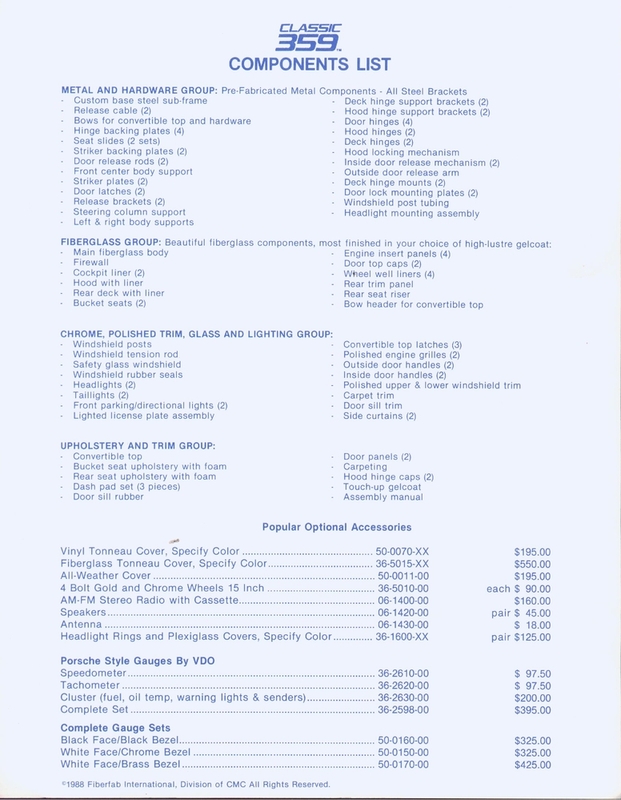 I was always trying to find the build manual to have it scanned and loaded to SOC. It seems like it sits on a full VW pan. 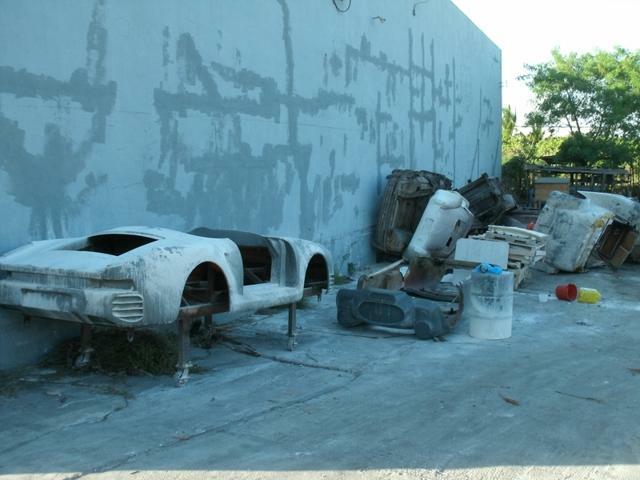 I have some photos of the molds used to flash the 359 body sitting out behind a garage somewhere. This red one showed up at Carlisle a few years ago. The owner"s name was Earl and he owned a local wrecking yard. Wouldn't it be cool with one of those Rusty Tubs hard tops? No, the body sits on a custom frame with a 89.5 inch wheel base, the same as the original 959 and 911. The VW pan has a 94.5 inch wheelbase. The 356 was shorter then the VW and 911. Thanks for the attachments! 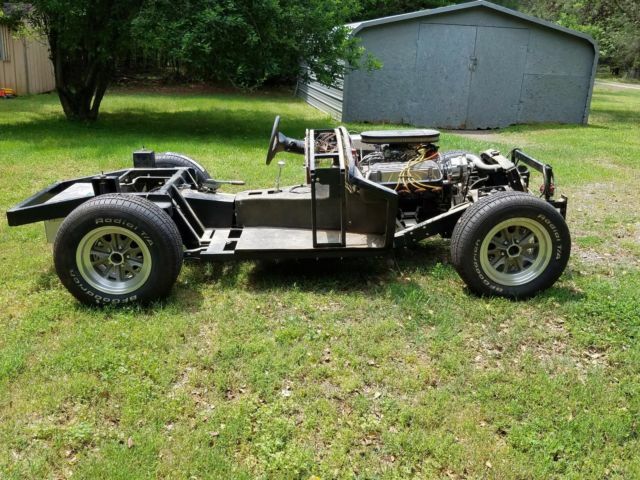 You can see what CMC did with the 359 after all they had the centre section from their old Speedster design. Only the doors on the 359 are interchangeable with the other CMC Speedsters. The whole car is longer and has a wider track to look like the real 959 Speedsters and they share the original wheel base of the 959. 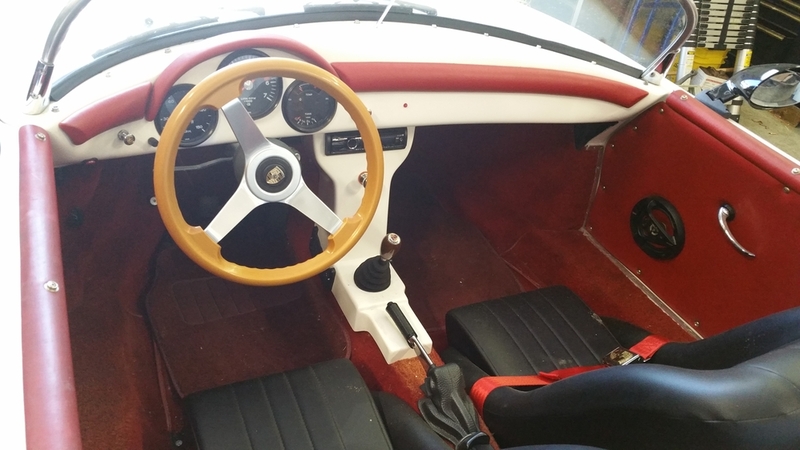 The Porsche 911 Speedster copied the old 356 Speedster windshield design. 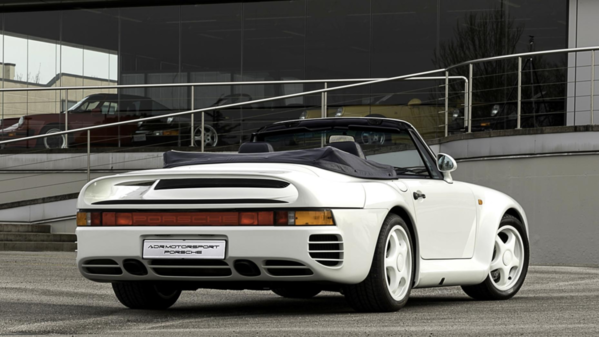 Becker used the 911 Speedster windshield design to create their real 959 Speedster. 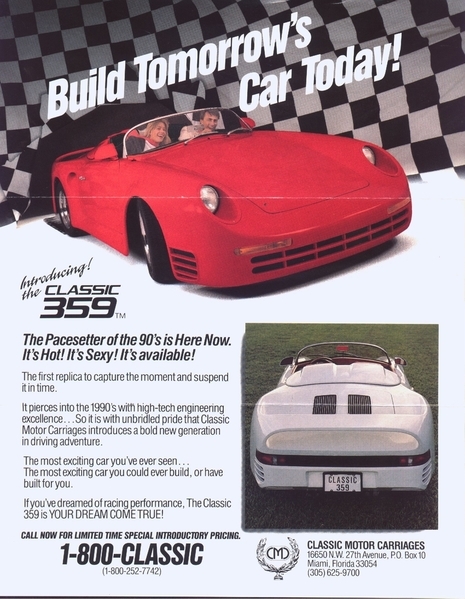 Of course CMC already had the old style 356 Speedster windshield design that they carried over to the 359 Speedster. later CMC even produced 959 Body Kits to convert Porsche 911's to make them look like 959s! TOP PIC: CMC 359 Speedster (959 Speedster replica). Here's a video walk around of a 359. It features the rare pine engine lid prop available at extra cost! Matching fine wood battery box. Must be original gel coat finish too. 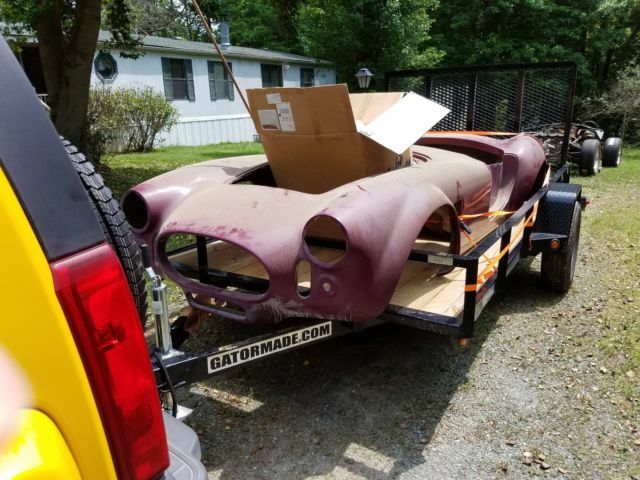 Car looks nice...will have to hone up on my wood working skills in order to replace my mechanical hood prop rod, engine cover lift strut and battery box! Lol! Body looks like 359 missing rear spoiler. Mold looks like 356. I also saw a 356 early CMC Speedster mold recently advertised on the Samba for sale! PS: what is that white body parked on it side? Looks interesting? Around 1992 CMC had a Cobra kit too. I've never seen one but hear they were very difficult to build. Apparently Street Beasts - CMC follow-on company - sold them too. That's the upside down blue body. Not sure what white one is - looks like a 550 Spyder but don't think CMC made one. Not sure what white one is - looks like a 550 Spyder but don't think CMC made one. 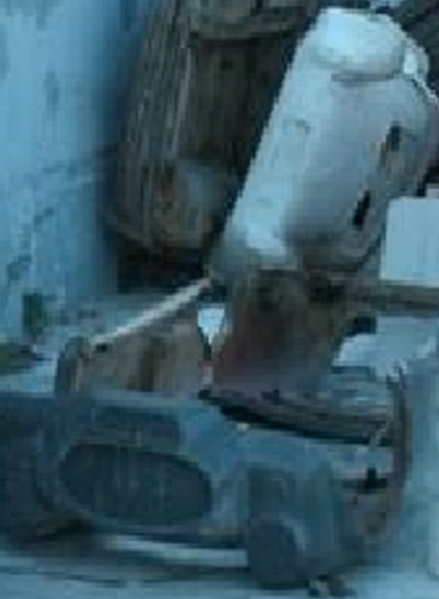 Someone identified that white car body mould last year. I've been looking everywhere for it but so far I haven't been able to find it. 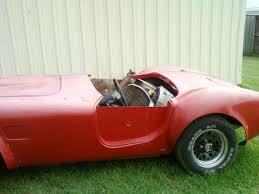 Yup- a rare CMC Cobra Coupe - the 2 what looked like rear vent holes threw me - the window was not yet cut out! Re "wood battery box": Fun fact: Porsche used a wood battery hold down on the original 550 to isolate the battery from the metal strap holding it down. I knew someone had identified it. Thank you Greg. 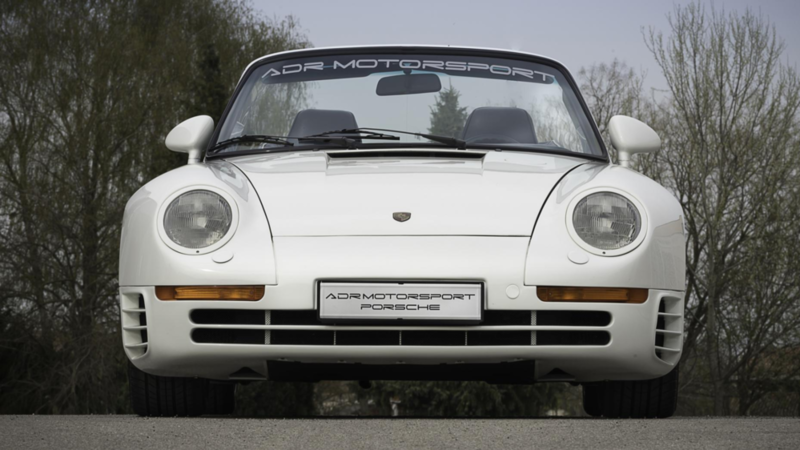 In 1987, Porsche delivered a Porsche 959 to German race driver Jürgen Lässig; who, owned the car up until he had an accident on the Autobahn in 1988. The 959 had flipped over and was severely damaged in the collision with an Audi 80 on the A 81 at Singen on the top, right front and on the side. From there it was bought by a company called Auto Becker. The damaged car went to Auto Becker in Dusseldorf where it was converted to convertible. The engine technology and the complete electronics remained untouched; Stiffeners were welded in. 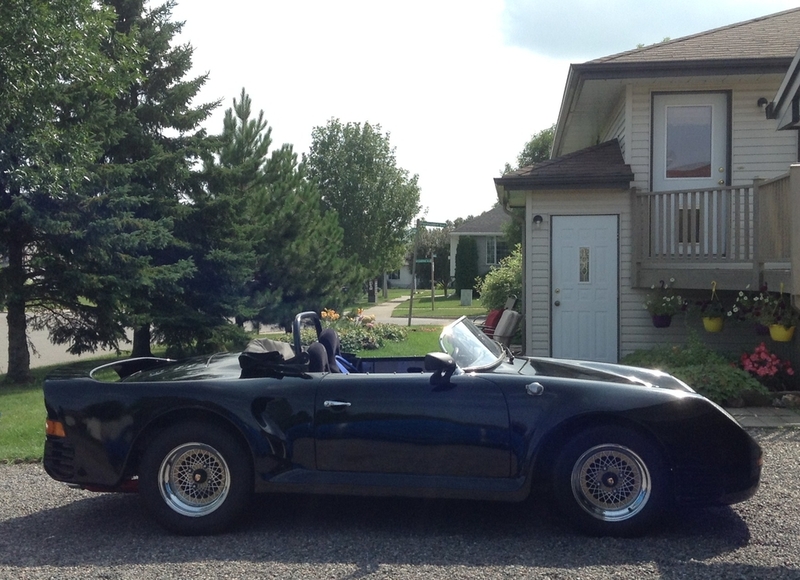 Becker chopped the roof off and fit a 911 Speedster windshield. They also fit a folding soft-top. Afterwards, the 959 Speedster was shown at the IAA show in Frankfurt. A collector from the US bought the car for allegedly 3 million D-Mark. 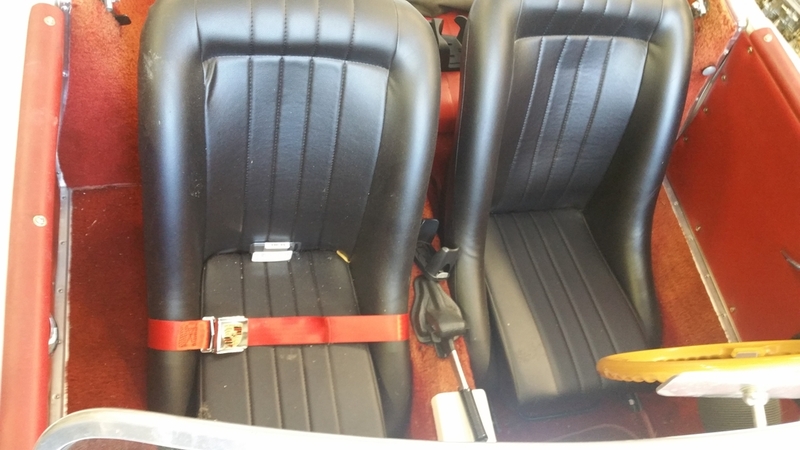 The car can also be converted at any time to a normal Cabriolet, or hard-top configuration. Becker preserved the original roof to be installed if so desired as a removable hard-top - by way of a few handles and the exchange of windscreen and hood. This original style roof was supplied in a very large custom made padded box. The 959 Speedster was tested by Sports Car International in February 1992. From the waistline down the car looks like the original 959 which it is. From the waistline up the 959 in Speedster mode looks like a 911 Speedster. It is interesting that the CMC replica 959 Speedster debuted in 1989. Reference, Peterson's Kit Car Magazine; issue, March, 1989. Therefore, CMC was likely inspired by Auto Becker 959 Speedster and got the idea to create the 359 Speedster from their replica Speedster. 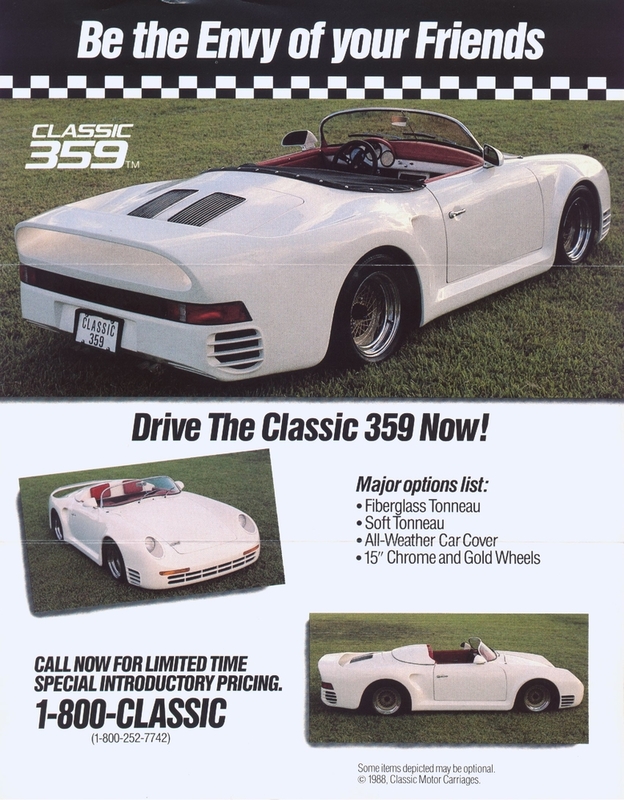 By then, CMC had vast experience with Speedster replicas and they wanted to make their own flag ship car for the US market since at that time all original 959's were prohibited from entering into the USA. 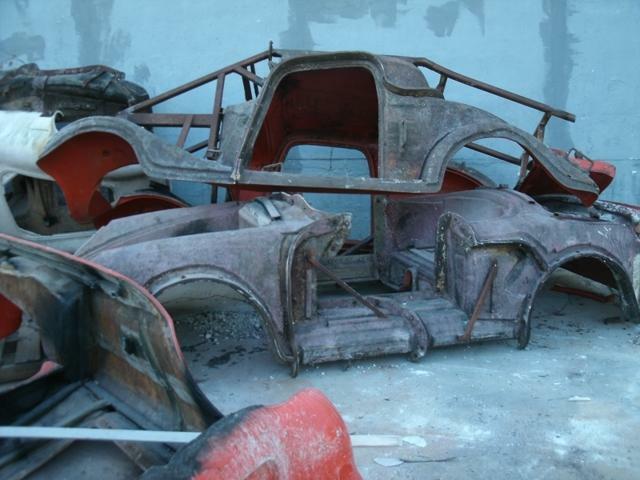 The 359 was layed up in its own molds, and is not a 356 with extra pieces grafted on. It was certainly made with single layups. The body shape is very different from a 356's,, and the wheel base is 89.5 inches like the original 959. A real 959 convertible - so the CMC 359 doesn't look so bad after all? Offered for sale for $1.1m recently! (or 1m Euros)! 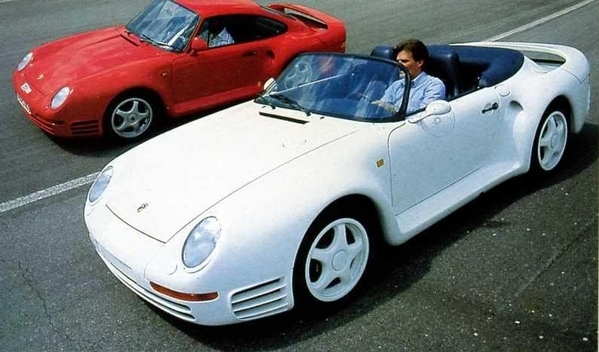 I never liked the 959 aesthetically. I know I am in the minority here and I have owned a 57 Speedster too as well as several 911's and P-cars. But, I always liked the 959. Never really liked the 356 Speedster all that much. i know they are worlds apart. 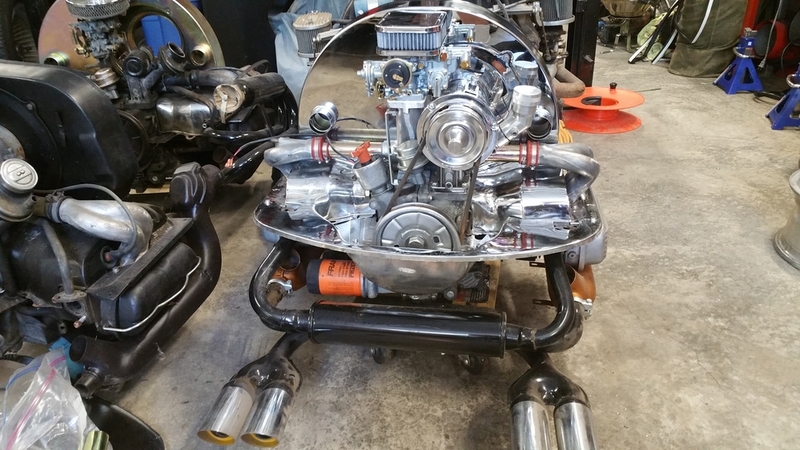 The first time I ever saw a Speedster in person I thought it looked like a upside down bathtub! Lol. Nice looks!! 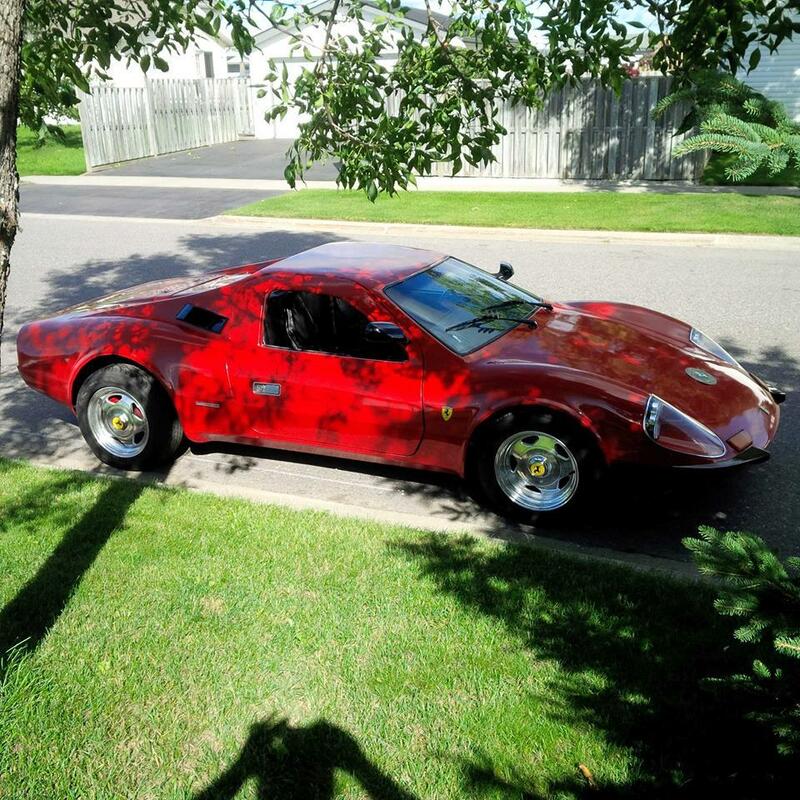 The red Dino that I built with a 455 V8 ! it got all the looks it was crazy! Although, my fav was my speed yellow RS! Trio of cars (Targa, Cab, and Coup) built on Real Porsche’s built at Classic Motor Carriages in the late 1980’s. 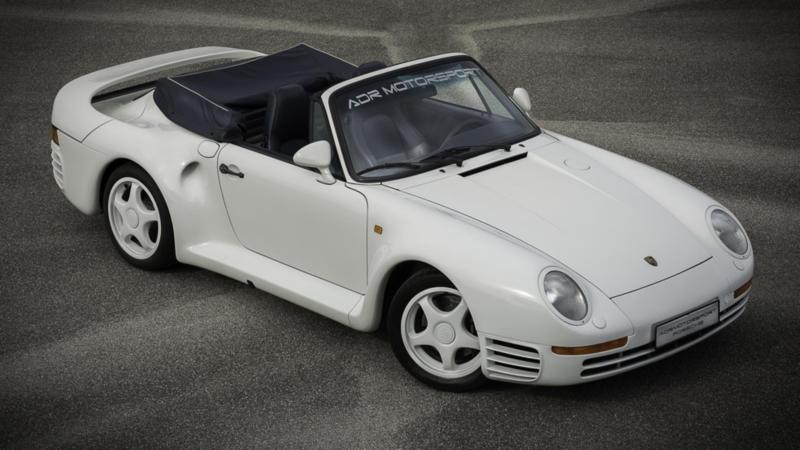 They were called the “Ultima” and for a modest amount your Porsche 911 could be fitted with a fiberglass body kit that would make it look like a real Porsche 959.